The Year-End Sales Event is our chance to do a little inventory cleaning—and your opportunity to take advantage of special year-end deals on retiring and surplus items.In addition, the 2018 Holiday Catalog is retiring. 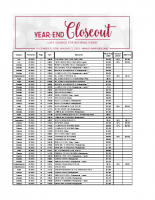 Here’s the pdf of all the retiring items from the 2018 Holiday Catalog, this list contains also contains surplus items featured in the Year-End Sales Event. The surplus items are not retiring, however the Holiday Catalog Retiring products will no longer be available for purchase after January 2, 2019. Check my online store for an up-to-date item list. This promotion features a selection of items that are last-chance and limited-inventory, so be sure to place your order while supplies last! Available to Customers & Demonstrators (demonstrators get additional demo discount on sale items). Excess items from 2018-19 annual catalog are available in limited quantities at the promotional price. Discounted items may be added to a Demo Starter Kit—or purchased with Stampin’ Rewards—at the promotional price. Host sets can be earned using only Stampin’ Rewards from a qualifying order ($150+).